Sorcerers gain a +2 class bonus to Charisma or Constitution, as long as it isn’t the same ability you increase with your +2 racial bonus. Possible backgrounds include: tribal shaman, pirate captain, spell-arena gladiator, failed wizard, sahuagin hunter. At 1st level, a sorcerer usually has a simple melee weapon, a few changes of clothing, a wand or staff, and other paraphernalia suggested by their backgrounds. Sorcerers may start with either 25 gp or 1d6 x 10 gp. Starting at 3rd level, you can take a wizard spell in place of a sorcerer spell. The wizard spell must be two levels lower than the sorcerer spell. Spells with the breath weapon keyword have a chance to be re-used during battle. Each breath weapon spell lists the chance of re-using it (usually 16+). At the start of each round after you’ve cast the breath weapon spell, make the re-use roll. Success indicates that you may re-use that spell as a standard action, but for that round only. If you fail the re-use roll, you don’t have the option to re-use the spell, but you get another chance at the beginning of the next round. The breath weapon power lasts for a single battle only. Failing a death save cancels any breath weapon spells you have active. Adventurer Feat Failing a death save no longer cancels your breath weapon spells. Keep rolling the entire battle. When you attack with a chain spell and get a natural even roll, you can roll another attack against a different enemy within range. Keep on rolling attacks as long as you get even rolls and don’t run out of new targets. Each enemy can be targeted only once. All sorcerers can cast the dancing lights spell as a standard action. Unlike the wizard’s light cantrip, the sorcerer’s dancing lights spell produces a number of varicolored light globes that bloom within 5 to 30 feet of the sorcerer every two to five seconds. The sorcerer has very little control over the exact location or illumination provided by the lights, meaning that they can occasionally be used for dramatic plot purposes. Once initiative has been rolled and a battle is underway, a sorcerer can spend a standard action to gather magical power, preparing themselves for casting a double-strength spell with their next standard action. Gathering power is loud and very noticeable. Sorcerers who want to gather power before initiative has been rolled can go through the motions but won’t get any benefit from the act. When a sorcerer gathers power, it does not count as casting a spell; you can gather power without taking opportunity attacks. In addition, because you spend your standard action to gather power, you generate a small magical benefit. Like many of your powers, this benefit is chaotic rather than perfectly reliable, so you must make a random check to see what benefit you get. Roll a d6 and consult the appropriate table below. If you get a benefit that deals damage to enemies, you can choose the type of damage (cold, fire, lightning, or thunder). 1-2 You gain a +1 bonus to AC until the start of your next turn. 3-4 Deal damage equal to your level to all nearby staggered enemies. 5-6 Deal damage equal to your level to one nearby enemy. 1-2 You gain a +1 bonus to AC and Physical Defense until the start of your next turn. 3-4 Deal damage equal to your level + your Charisma modifier to all nearby staggered enemies. 5-6 Deal damage equal to your level + your Charisma modifier to one nearby enemy. 1-2 You gain a +1 bonus to all defenses until the start of your next turn. 3-4 Deal damage equal to your level + twice your Charisma modifier to all nearby staggered enemies. 5-6 Deal damage equal to your level + twice your Charisma modifier to one nearby enemy. After you have gathered power, you can use your next standard action to cast an empowered sorcerer spell. Empowered sorcerer spells deal double the damage of a normal sorcerer spell. This means that you double the damage results of the hit or a miss from the single spell. Non-attack spells generally don’t improve when cast empowered; use empowered casting for attacks. If you do not or are not able to use your next standard action to cast a sorcerer attack spell, you lose the power you’ve gathered. You can use another standard action to gather power again, but the spell you eventually cast will still only do double damage. You can spend your move actions and quick actions any way you like after you gather power and before casting your next empowered spell. Yes, once a battle has started it’s possible to perform the magical firefight trick of gathering power while hiding to the side of the cave entrance, then jumping into the cave opening on your next turn and blasting with the empowered spell. Breath weapon spells add an extra wrinkle. Of course you can gather power the first time you cast a breath weapon spell in a battle. Later in the fight it’s a question of whether you gathered power the turn before a breath weapon spell roll goes your way. You can be all ready with gathered power but roll too low to use the breath weapon spell, forcing you to cast a different spell with the gathered power. If you’ve gathered power for a spell that deals ongoing damage, the ongoing damage is doubled the first time it is dealt, but not on subsequent rounds, if any. Adventurer Feat Once per battle, you can choose the chaotic benefit you want instead of rolling for it. Champion Feat Once per battle when the escalation die is 4+, you can gather power as a quick action. Epic Feat When you gather power, if the escalation die is 2+, you can roll two chaotic benefits. Unlike most effects, the benefits stack if you roll the same result twice. Some sorcerer spells deal damage of a random type. If it matters for the situation, use a d4 to determine which type of damage the spell deals. Sorcerers possess innate talent for magic that is impulsive and chaotic where wizardry is measured and studied. Most sorcerers have strong magical links to one of the icons. Although magic is in the blood of every sorcerer, you have a greater understanding of magic than most sorcerers and even some wizards. You gain a +2 bonus to a background that involves or suggests magical knowledge or talent, up to your normal maximum background point limit. You can also use one of your sorcerer spell choices to choose any wizard spell of the same level. You get only one such equal-level wizard spell at a time; all others have to be purchased using the 2-level penalty in the Access to Wizardry class feature described above. Adventurer Feat Use your Charisma as the attack ability for the wizard spell you choose with your Arcane Heritage talent. Champion Feat You can cast your wizard spells empowered as if they were sorcerer powers. Generally, empowering wizard spells only helps by doubling the damage. Champion Feat Gain another relationship point with an icon associated with one of your heritage talents. As above, you must follow the relationship maximums. You can have multiple breath weapon spells active at the same time. You don’t gain extra actions, so if you succeed with multiple breath weapon spells, you’ll generally have to choose which one to use. Adventurer Feat You gain a +2 attack bonus with empowered breath weapon spells. Champion Feat Once per day, turn a failed breath weapon re-use roll into a success. Epic Feat One battle per day, gain resist dragon attack 16+ (all attacks made by dragons; dragon must roll natural 16+ with the attack or it deals only half damage). One battle per day, when you roll initiative, you can choose to invoke your Fey Heritage and gain the racial power of one the elven races in addition to your own racial power. Roll on the table below. If you roll your own race’s power, you gain the half-elf’s surprising racial power instead. Adventurer Feat You can now invoke your Fey Heritage talent in two battles each day. Champion Feat You gain a +2 attack bonus against elves and monsters in the elven sphere of influence (including the Drider, Storm Giant, and Medusa). 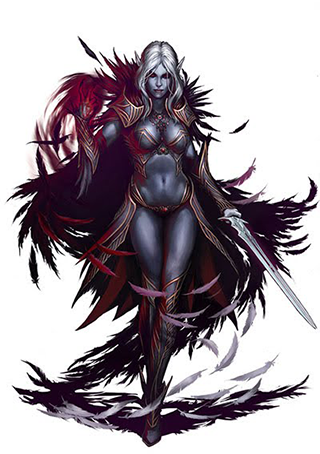 Epic Feat Once per battle when the escalation die reaches 6+, as a free action, you can gain an elf racial power that you have not already used in this battle. Once per day, as a quick action when the escalation die is 1+, you can enter a spell frenzy until the end of the battle. While in a spell frenzy, you roll 2d20 for each of your sorcerer spell attacks. Use the highest die as your attack roll, but track whether the other die hits. For each die that misses, you take damage equal to double the level of the target of your attack. Adventurer Feat You gain resist energy damage 12+ to fire and to one of the following types of energy of your choice: acid, cold, lightning, psychic, thunder. Champion Feat Increase one of your resistances to 16+. Epic Feat In addition to your normal use of spell frenzy, you can also enter a spell frenzy as a free action while the escalation die is 5+. Your rolls to re-use breath weapon spells during a fight gain a +2 bonus. Adventurer Feat As a quick action at the start of each battle, you can gain resist energy 12+ to one of the following types of energy of your choice: acid, cold, fire, lightning, or poison. Champion Feat When you gather power and your chaotic benefit increases your defenses, you can choose one nearby ally to gain the same defense bonus. Epic Feat One battle per day, you can choose to gain resist demon attack 16+ instead of resist energy 12+ from your Metallic Protector Heritage talent. You have a familiar much like a wizard’s familiar, but more changeable. Unlike the wizard, you don’t choose two abilities for your familiar. Instead you choose one permanent ability that suits your familiar’s nature; the only limitation is that you can’t choose tough as the permanent ability. Each time you get a full heal-up, randomly determine two other abilities your familiar will possess until your next full heal-up. Adventurer Feat Your familiar gains another randomly changing ability. Champion Feat Once per level, if your familiar is close to you, it can cast one of your spells as a free action on your initiative count, even if you have already expended the spell. The spell functions as if you had cast it. Epic Feat Your familiar gains another randomly changing ability. Your style of sorcery emphasizes close-range fighting. There are two advantages and one possible drawback to your style. You gain a +2 bonus to AC. You can use ranged spells while engaged with enemies without taking opportunity attacks. You use your Constitution modifier instead of your Charisma modifier to determine the damage you add to all your sorcerer spells. Adventurer Feat When you miss with a sorcerer spell against an enemy you are engaged with, add your Charisma modifier to the damage you deal. At 5th level, add double your Charisma modifier; at 8th level, triple it. Champion Feat Once per battle, you can include one enemy engaged with you as an additional target of any attack spell you cast that targets other enemies. Epic Feat Once per day when you cast an empowered spell, each enemy engaged with you becomes an additional target of that spell if it’s not already targeted by the spell. You have resist negative energy 12+ and gain a +1 attack bonus against undead. You can also include negative energy damage on your personal random energy damage type table, swapping out an energy type you don’t want to access randomly. Adventurer Feat Decrease your total recoveries by 1; you gain a +2 bonus to death saves. Champion Feat Your resist negative energy power improves to 16+, and the attack bonus against undead increases to +2. Epic Feat If you put out one of your eyes and cut off one of your hands, you gain a +1 bonus to all attacks. Hit: 3d6 + Charisma cold damage. 3rd level spell: 5d6 damage. 5th level spell: 4d10 damage. 7th level spell: 6d12 damage. Breath Weapon: For the rest of the battle, roll a d20 at the start of each of your turns. On a 16+, you can use breath of the white dragon that turn if you wish. Hit: 1d6 + Charisma fire damage. 3rd level spell: 1d8 damage. 5th level spell: 2d8 damage. 7th level spell: 3d8 damage. 9th level spell: 5d8 damage. Adventurer Feat When you miss with burning hands, you deal fire damage to the target equal to each damage die that rolled its maximum possible result. Champion Feat When you roll a natural 18+ with a burning hands attack roll, you can choose another nearby target for the spell. The new target doesn’t have to be part of the original group. Epic Feat You can now target each enemy engaged with you with your burning hands spell in addition to any other targets. Special: The first time you use chaos bolt each battle, determine a random energy type. The spell deals that type of damage each time you use it that battle. Hit: 1d8 + Charisma random energy damage, and if the natural attack roll was even, you gain a chaotic benefit as if you had gathered power. 3rd level spell: 3d8 damage. 5th level spell: 5d8 damage. 7th level spell: 7d8 damage. 9th level spell: 9d8 damage. Adventurer Feat You don’t take the –2 penalty for attacking a far away enemy with the spell. Champion Feat If you are a champion-tier sorcerer, roll any chaotic benefit gained with this spell on the epic chaotic benefits table. If you are an epic-tier sorcerer, choose the epic chaotic benefit you want instead of rolling. Hit: 3d6 + Charisma lightning damage. 5th level spell: 6d10 damage. Adventurer Feat Once per battle, you can reroll one of your lightning fork attacks rolls. Champion Feat If you miss all targets with lightning fork, you don’t expend it. Epic Feat The recharge roll for lightning fork is now 11+. Chain Spell: Each time you make a natural even attack roll, you can attack a different target with the spell. Effect: Until the end of the battle, the target gains resist damage 12+ to the following energy type of your choice: cold, fire, lightning, thunder. 3rd level spell: Choose two types of energy the target gains resistance to. 5th level spell: Resistance is now 16+. 7th level spell: The spell now affects two targets. 9th level spell: Recharge roll is now 11+. Adventurer Feat You can target an additional creature with the spell. Hit: 1d6 + Charisma fire damage, and if the natural attack roll is even, the target also takes 1d8 ongoing fire damage. 3rd level spell: 3d6 damage; 2d4 ongoing. 5th level spell: 4d6 damage; 2d6 ongoing. 7th level spell: 6d6 damage; 3d6 ongoing. 9th level spell: 10d6 damage; 5d6 ongoing. Adventurer Feat You can now use the spell against a far away target, but with a –2 attack penalty. Champion Feat Each time you cast the spell, you can have the attack deal random energy damage instead of fire damage. Replace the fire entry on the random energy table with your choice of negative energy or acid. Epic Feat You don’t take the –2 penalty for attacking a far away enemy with the spell. Hit: 15 + Charisma ongoing poison damage. Miss: 5 ongoing poison damage. 5th level spell: 25 + Charisma ongoing poison damage; 10 ongoing on a miss. 7th level spell: 35 + Charisma ongoing poison damage; 15 ongoing on a miss. 9th level spell: 50 + Charisma ongoing poison damage; 25 ongoing on a miss. Breath Weapon: For the rest of the battle, roll a d20 at the start of each of your turns; on a 16+, you can use breath of the green that turn if you wish. Hit: 3d10 + Charisma random energy damage. Odd Miss: Damage equal to your level. 5th level spell: 5d10 damage. 9th level spell: 9d10 damage. 5th level spell: You can now fly until the end of your next turn. 7th level spell: You can now fly twice as fast as you normally move on the ground. You also gain a +5 bonus to disengage checks. 9th level spell: The spell is now recharge 16+ after battle instead of daily. 5th level spell: 5d6 damage; 2d6 aftershock damage. 7th level spell: 7d6 damage; 3d6 aftershock damage. 9th level spell: 9d6 damage; 4d6 aftershock damage. Champion Feat The spell’s aftershock damage is now also doubled when echoing thunder is empowered. Hit: 10d6 + Charisma acid damage, and 20 ongoing acid damage. Miss: 10 ongoing acid damage. 7th level spell: 10d10 damage, and 40 ongoing damage; 20 ongoing on a miss. 9th level spell: 2d6 x 10 damage, and 60 ongoing damage; 30 ongoing on a miss. Epic Feat Double the spell’s ongoing damage on a miss. Breath Weapon: For the rest of the battle, roll a d20 at the start of each of your turns; on a 16+, you can use breath of the black that turn if you wish. Special: Once you cast this spell in a battle, you can cast it at-will for the rest of that battle. Hit: 8d6 + Charisma psychic damage, and if the natural attack roll is even, you can teleport to a nearby location you can see. 7th level spell: 9d10 damage. Epic Feat Once per battle, the teleport from a hit with the elven shadows can be to a far away location you can see. Miss: Half damage, and you still take random energy damage equal to the unmodified dice roll. 9th level spell: 2d12 x 10 damage. Effect: You gain a +5 bonus to all Charisma skill checks for the next five minutes. If you fail a Charisma skill check during this time, however, anyone you were attempting to convince or influence with the check is freaked out or disgusted by the supernatural glamour attached to you and has extremely negative reactions to you. 7th level spell: The effect lasts for 1 hour. 9th level spell: The effect lasts for 2 hours. Hit: 10d12 + Charisma lightning damage, and at the start of the target’s next turn, 1d6 of its nearby allies take 20 lightning damage. Miss: Half damage, and no damage to target’s allies. 9th level spell: 2d10 x 10 damage; 25 lightning damage to nearby allies. Epic Feat You can now target a far away enemy with the spell (no attack penalty). Breath Spell: For the rest of the battle, roll a d20 at the start of each of your turns; on a 16+, you can use breath of the blue this turn if you wish. Effect: You steal the once-per-battle racial powers of your allies this battle, but you don’t get the advantage of your allies’ feats or items that improve those powers. Each ally you steal a racial power from can roll an easy save (6+). Success means they get to use their power also this battle. Failure means they can’t; you took it fully. You can’t steal racial powers you already possess. 9th level spell: You get to use your allies’ powers as if you also had any of their feats that improve those powers. Special: If you are fighting one or more demons, roll an easy save (6+) at the start of each of your turns. Failure means that you are confused that turn. Effect: You gain a random demon-style power for the rest of the battle, similar to the abilities demons possess but not identical. 1 Resist energy 16+ When an attack that deals energy damage targets you, the attacker must roll a natural 16+ on the attack roll or it only deals half damage. 2 Infernal battery Until the end of the battle, you can use a quick action once each round to make recharge rolls for your expended recharge spells. Each time you do so, you take damage equal to half the natural result of your recharge roll. 3 Backlash The first time you are staggered this battle, the enemy who staggered you becomes confused (save ends). 4 Spell frenzy You enter a spell frenzy (see Infernal Heritage talent). If you were already in a spell frenzy, you now roll 3d20 for each attack and take damage equal to triple the target’s level for each roll that misses. 5 Fear aura Enemies engaged with you that have fewer hit points than double your current hit points are dazed. They cannot use the escalation die. 6 Teleport 1d3 + 1 times this battle As a move action, you can teleport anywhere you can see nearby. 7 Demonic speed You can take an extra standard action each turn that the escalation die is even. You lose 2d10 hit points each time you use the extra action. 8 Eye of the demon Choose any two features you want. For the rest of this day, all your icon relationships disappear and are replaced by an identical number of conflicted points with a villainous icon (preferably one that is demonic). Hit: 2d12 x 10 + Charisma negative energy damage, and the target moves down 2d6 points in initiative order, to a minimum of 1. Breath Spell: For the rest of the battle, roll a d20 at the start of each of your turns; on a 16+, you can use breath of the void this turn if you wish. Effect: Randomly select an icon (preferably a sorcerous one). You gain some surprising or bizarre magical effect associated with the power of that icon to assist you. The effect is entirely up to the GM, though the immediate impact of the spell should always be favorable for you. The long-term consequences of randomly invoking the power of an icon that may be an enemy might not be favorable for you, and should be played for narrative interest by the GM, particularly if the impact of the spell was huge for you. Since this is a daily spell, sizeable impact is fine, but don’t award any extra effect for empowered casting, especially since the spell can be cast effectively out of combat. Epic Feat Randomly choose twice, then choose the single result you prefer. Effect: Roll your relationship dice that you have with a sorcerous heroic icon. For each 6 you roll, you gain one 7th level or lower spell from any spellcasting class that you can cast this battle. For each 5 you roll, you gain one 5th level or lower spell from any spellcasting class that you can cast this battle. If the escalation die is 5+, you can swap the escalation die for one or your rolls. If you get no successes, you regain the spell after this battle. You can acquire one of the new spells the same round you cast this spell. Then select and acquire any other gained spells at the start of your next turn. You can use your Charisma as the ability score that provides the acquired spells’ attack bonuses and damage bonuses (if any). Other ability score references remain unchanged. As you might expect, each 5 you roll also invokes an icon-related complication or obligation in the tradition of rolling 5s on relationship checks.